Sbestore is an online shopping store. All Electrical products are available. Sbestore creating best relationship with it's valued customers through its products and services. This Online Estore offers a wide range of home appliance products. We value our customers to buy and receive best stuffs at door step. 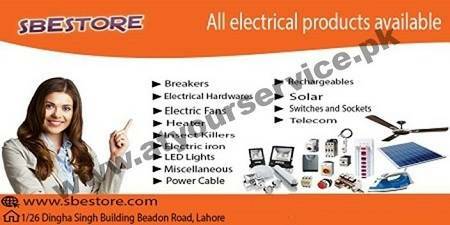 In Pakistan, Sbestore is online shopping sellers offer all electrical products for Offices, Home, Hospital, Buildings & Malls etc. Sbestore is the top retailers of home appliances and electrical products in Pakistan. Main products are; Exports Electronic, Breakers Electric Fans, Heater , Miscellaneous, Rechargeable, solar panel, Insect Killers, Electric Irons, LED Lights, Switches and Sockets, Telecom, Power Cable, Flood Lights and all small and built-in Home Appliances.